DC lets its proprietary guard down for a contained barrage of absurdity; allowing its audience a glimpse at the super-id that lies beneath the super-ego of its stable of heroes. 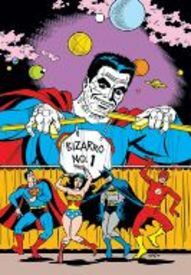 This long awaited sequel to the popular Bizarro Comics is a veritable who's who of the indy comics world. Starting off with a cover by Locas maestro, Jaime Hernandez, the line-up inside includes Rick Altergbott, Peter Bagge, Ariel Bourdeaux, Ivan Brunetti, Eddie Campbell, Dave Cooper (in a ten-page opus featuring Super Girl and Wonder Woman), Leela Corman, Evan Dorkin, Ben Dunn, Sarah Dyer, Phil Elliot, Hunt Emerson, Asaf & Tomer Hanuka, Gilbert Hernandez, Dylan Horrocks, James Kochalka, Michael Kupperman (he's in his element here), Roger Langridge, Tony Millionaire (with a very gothic Batman), Harvey Pekar teams up with Dean Haspiel, Craig Thompson, Pittsburgh's own Don Simpson -- even the French team of Philippe Dupuy & Charles Berberian! And many more. Fab fan fun.